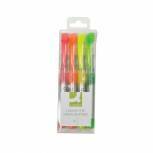 Q-Connect Assorted Highlighter Pens (Pack of 6) KF01909 Pack of 1 Q-Connect Highlighter Pen. The chisel tip draws both broad lines for highlighting or narrow lines for underlining. Suitable for most papers and will not fade on fax paper. Wallet of 6 assorted colours - yellow, green, orange, Blue, red and pink. 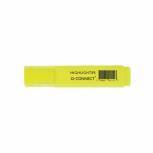 Yellow Hi-Glo Highlighter Pen (Pack of 10) HI2717 819111 Pack of 10 Q Connect Highlighter Pen. Bright fluorescent colours for highlighting important words etc. The chisel tip draws both broad lines for highlighting or narrow lines for underlining. Suitable for most papers and will not fade on fax paper. Colour - Yellow. 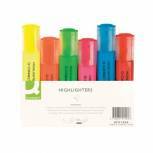 Assorted Hi-Glo Highlighters (Pack of 4) 7910WT4 Pack of 1 Highlighter Pen. The chisel tip draws both broad lines for highlighting or narrow lines for underlining. Suitable for most papers and will not fade on fax paper. Wallet of 4 assorted colours: yellow, green, orange and pink. 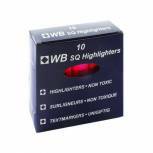 Pink Hi-Glo Highlighter (Pack of 10) HI2717 819128 Pack of 10 Highlighter Pen. Bright fluorescent colours for highlighting important words etc. The chisel tip draws both broad lines for highlighting or narrow lines for underlining. Suitable for most papers and will not fade on fax paper. Colour - Pink. 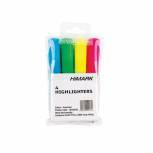 Orange Hi-Glo Highlighter (Pack of 10) HI2717 819135 Pack of 10 Highlighter Pen. Bright fluorescent colours for highlighting important words etc. The chisel tip draws both broad lines for highlighting or narrow lines for underlining. Suitable for most papers and will not fade on fax paper. Colour - Orange. 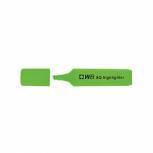 Green Hi-Glo Highlighter (Pack of 10) 844004 Pack of 10 Highlighter Pen. Bright fluorescent colours for highlighting important words etc. The chisel tip draws both broad lines for highlighting or narrow lines for underlining. Suitable for most papers and will not fade on fax paper. Colour - Green. 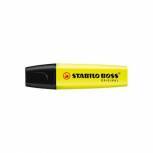 Stabilo Boss Original Highlighter Yellow 70/24/10 Pack of 10 Brand leading fluorescent marker with universal ink for use on most papers including fax and NCR paper. Now with longer writing length and increased 4 hour cap-off time. 2-5mm line width. Water-based ink. Yellow. Pack of 10. Q-Connect Yellow Highlighter Pen (Pack of 10) KF01111 Pack of 1 Q-Connect Highlighter Pen. Bright fluorescent colours for highlighting important words etc. The chisel tip draws both broad lines for highlighting or narrow lines for underlining. Suitable for most papers and will not fade on fax paper. Colour - Yellow. 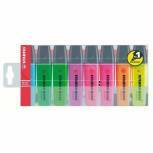 Stabilo Boss Original Highlighter Assorted (Pack of 8) 70/8 Pack of 1 Brand leading fluorescent marker with universal ink for use on most papers including fax and NCR paper. 4 hour cap-off time. 2-5mm line width. Water-based ink. Blue Hi-Glo Highlighter Pens (Pack of 10) 844003 Pack of 10 Highlighter Pen. Bright fluorescent colours for highlighting important words etc. The chisel tip draws both broad lines for highlighting or narrow lines for underlining. Suitable for most papers and will not fade on fax paper. Colour - Blue. Stabilo Boss Original Highlighter Assorted (Pack of 10) 70/10-1 Pack of 1 Brand leading fluorescent marker with universal ink for use on most papers including fax and NCR paper. Now with longer writing length and increased 4 hour cap-off time. 2-5mm line width. Water-based ink. 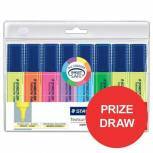 Staedtler Textsurfer Classic Highlighter Assorted (Pack of 6) + 2 Free 364AWP8 Pack of 1 Staedtler Highlighter. Universal, lightfast fluorescent pigment ink. All colours are safe on inkjet paper without smudging text. Turquoise and violet ink allows for clear text on photocopying. Chisel point. Assorted pack of 6 + 2. 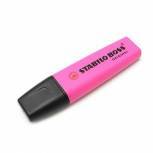 Stabilo Boss Original Highlighter Pink 70/56/10 Pack of 10 Brand leading fluorescent marker with universal ink for use on most papers including fax and NCR paper. Now with longer writing length and increased 4 hour cap-off time. 2-5mm line width. Water-based ink. Pink. Pack of 10. 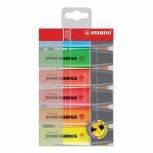 Stabilo Boss Original Highlighter Assorted (Pack of 6) 70/6 Pack of 1 Brand leading fluorescent marker with universal ink for use on most papers including fax and NCR paper. Now with longer writing length and increased 4 hour cap-off time. 2-5mm line width. Water-based ink. Stabilo Boss Original Highlighter Green 70/33/10 Pack of 10 Brand leading fluorescent marker with universal ink for use on most papers including fax and NCR paper. Now with longer writing length and increased 4 hour cap-off time. 2-5mm line width. Water-based ink. Green. Pack of 10. 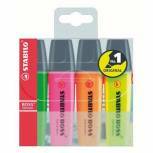 Stabilo Boss Original Highlighter Assorted (Pack of 4) 70/4 Pack of 1 Brand leading fluorescent marker with universal ink for use on most papers including fax and NCR paper. Now with longer writing length and increased 4 hour cap-off time. 2-5mm line width. Water-based ink. 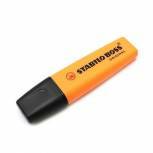 Stabilo Boss Original Highlighter Orange 70/54/10 Pack of 10 Brand leading fluorescent marker with universal ink for use on most papers including fax and NCR paper. Now with longer writing length and increased 4 hour cap-off time. 2-5mm line width. Water-based ink. Orange. Pack of 10. 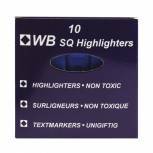 Q-Connect Liquid Ink Highlighter Assorted (Pack of 4) KF16127 Pack of 1 Highlighter pen for emphasising important information. For vibrant yet clear highlighting. Suitable for most types of paper without fading. Visible ink shows when you are running low. 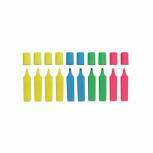 Ink colour: yellow, pink, orange and green. Pack of 4 pens. 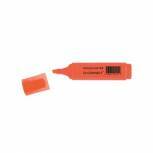 Q-Connect Orange Highlighter Pen (Pack of 10) KF01115 Pack of 1 Q-Connect Highlighter Pen. 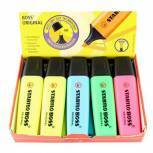 Bright fluorescent colours for highlighting important words etc. The chisel tip draws both broad lines for highlighting or narrow lines for underlining. Suitable for most papers and will not fade on fax paper. Colour - Orange.